DISNEY Good Neighbor, SEA WORLD, Beaches Location! Location!Location! The Lake Buena Vista Resort Village and Spa is a full service, luxury destination resort. There's something for the entire family and it's all within walking distance. Whether you want to take a swim in the pool or soak in the soothing hot tubs, the choice is yours. The Hotel Condo Resort Village includes a spectacular aquatic center with zero-entry pool, world-class health spa and salon, state-of-the art fitness center, convenience store and gift shop, Irish pub and grille, pizzeria, conference center, children's play area and much more. One of Orlando's premier outlet malls is right next door. Indulge yourself with unique massage and facial treatments in the signature health spa, 'Reflections Spa-Salon'. For your convenience, there is free shuttle service to Walt Disney World, Sea World and Universal Studios for owners and their guests, as well as concierge and business services. Whatever your pleasure, the Lake Buena Vista Resort will accommodate. That's why we say, 'Unpack Once and See It All'. Whether you want to visit the theme parks, do some power shopping, hit a few golf balls, keep up with your workout, watch the fireworks from your balcony or simply relax and rejuvenate, it's all here in your resort residence. Lake Buena Vista Resort Village's 'Reflections Spa-Salon', a world-class signature health spa, offers a diverse menu of spa services in a serene setting to pamper, indulge and rejuvenate. The Spa offers tropical themed, unique, full service skin and body care treatments; including facials, body wraps, relaxing baths and salon services; as well as therapeutic massages await you. Relax! Your're on vacation! There is a variety of services on the menu at the 'Reflections Spa-Salon' for you to choose from. The resort's spectacular, interactive, zero-entry pool is open and getting rave reviews. Whether it's from the kids enjoying the pirate ship's water slide, cannons and other water features or the adults relaxing in one of the three spas, loungers or hammocks, this tropical paradise has something for everyone. Relaxation Pool: Enjoy quiet and relaxation while soaking up some of our famous Florida sunshine next to our relaxation pool, located between Buildings 1 and 2. This pool offers poolside loungers and towels. The tropical oasis of palm trees and tropical plants surrounding the pool add to the relaxation. This pool is open daily until 10:00pm and is heated seasonally for your enjoyment. 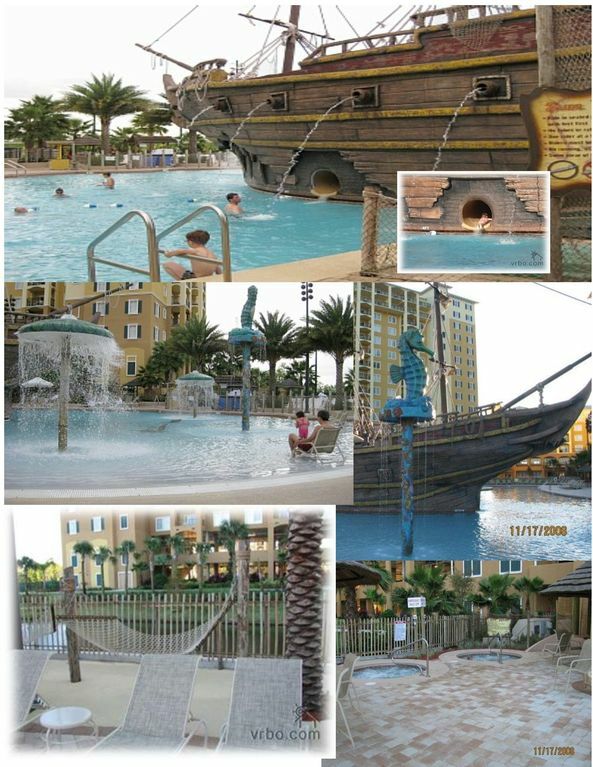 Pirates Plunge Themed Pool: Our spectacular, zero-entry pool features a Pirate Shipwreck complete with shooting water cannons, a water slide, Jacuzzi-style hot tubs, tumbling waterfalls, poolside loungers and hammocks. The whole family will enjoy this fabulous pool. Plus, the poolside tiki bar, Lani’s Luau adds to the fun, enjoy a cocktail grab a bite to eat next to the pirate ship! A giant pirate ship anchors the 25,000 square foot aquatic center. Features include: a 7,500 square foot zero-entry pool, a water slide within the pirate ship, three interactive play features: two 'Under-Brella' domed circular waterfalls and a 'Port Beacon' water curtain, five water cannons, three large spas with rock work and landscaping, a poolside tiki bar , loungers and hammocks. The first Pizza Hut Cafe Express in central Florida opened at the Lake Buena Vista Resort Village & Spa, coinciding with the nationwide debut of this new Pizza Hut concept. The 3,000 square foot, poolside restaurant is one of only two locations in the state. The menu includes classic Personal Pan Pizzas, Personal Primo Pizzas, as well as sandwiches, salads and a breakfast menu. The centerpiece of the new concept is an entertainment-style cooking area that allows customers to watch their meals being prepared. Frankie Farrell's Irish Pub & Grille is located in Lake Buena Vista Resort Village. Owned and operated by a former Dublin pub owner, he has recreated some of the elements that make the great pubs of Ireland truly unique. Sporting real Irish pub spirit and decor, Frankie Farrell's is a gathering place where friendly bartenders and servers will make you feel at home. Come enjoy the art of conversation, watch one of the 17 large plasma televisions or just sit back and relax. With 32 taps dispensing such great beers as Guinness, Mangers, Boddingtons, Bass and more, coupled with great traditional Irish and American fare, you can enjoy the best of Ireland while in Orlando. Located next to Frankie Farrell's is the resort's new game room. Enjoy the video games, pool tables and more. The 2,000 square foot Conference Center has a large room that can accommodate 150 people and there are two breakout boardrooms. Only a few steps from the luxurious resort condo hotel is Lake Buena Vista Factory Stores, one of Orlando's premier outlet malls. With over 50 stores offering incredible savings on national, designer and name brands, there's something for the entire family. Stores offer factory direct, premium quality merchandise at savings up to 75% everyday! Designer & name brands: Aeropostale, Bass, Carter's, Character Outlet; featuring Disney merchandise for less; Converse Shoes, Dressbarn, Eddie Bauer Outlet, Fossil, Gap Outlet, Haggar, Izod, Ann Taylor Loft, Nike Factory Store, Nine West Outlet, Old Navy, OshKosh, Reebok, Samsonite, Tommy Hifiger, Travelpro, VF Outlet, Van-Heusen, Vitamin World, Wilsons Leather Outlet, Ecko Unlimited and many more! Shoppers love our quiet and relaxed village setting with convenient store front parking. Stop by our Center Food Court or Internet Cafe-World of Coffee for speciality coffees, desserts and a wide selection of favorite food items. Relax in the Florida sunshine as your children play in our playground. Our Family are serious Florida Fans. We love Disney and Sea World but wanted to be able to go the Beaches! 'I love this Place' I have a family of four and we are from the Pittsburgh Pennsylvania Area. We visit our home about 2 times a year. My name is Patricia Hodovanich, I am Self-Employeed , I am a partner in a Mechancial Company located by the greater Pittsburgh International Airport. Construction in our area is slow so I am helping my management company rent my vacation home. Our children are still young and enjoy our family time!!! When we travel to Florida we leave our cares and worries behind and enjoy spending time together. I feel very comfortable allowing my children to go swimming in the private pool while I watch them on my balcony over looking the pool. My husband and I enjoy the conversations without too many interuptions! toilet, combination tub/shower, Large bathroom for everyone to use! toilet, tub, shower, jetted tub, 'Relaxing Jetted Tub.' Full closets. New flat screens in all rooms. We always have the same experience at our vacation home! " We love it! The unit was a great size! Trip was good. The pool is under construction and work is being done on it while we are in it. Stove did not work - they came up to fix and it still is not working correctly. Thanks for letting me know about the stove... I will call them asap to make sure they fix it. All units do not have maid services unless you arrange for it and it is an additional fee..... PLEASE Remember this is not a Hotel. Once we finally got checked in it was GREAT! Check in was terrible. Almost 45 minutes and there were only about 10 families on line. Was so slow and so hard with kids. But once we got into our room the rest of the trip was great! Comfortable, convenient to everything and the kids loved the Pirate Ship and Pool! Really enjoyed our week and would definitely stay here again. Booking everything was great with Pat Hodovanich. She followed up, sent reminder emails and was available for all questions. Thanks Pat! My family and I stayed here for a trip to Disney World. I was able to take daily rideshares to Disney for cheap and was joined in the afternoon by my family. Amazing location, got to avoid a lot of the North/South traffic. And it's in the same building as an Irish pub, which was wonderful for a trip that included St. Patricks Day. Only downside -- property was missing an iron, which I needed for my Disney outfits, and was really inconvenient. Also the smoke detectors were so sensitive that they went off after a hot shower and woke up my sleeping family members as well as our neighbor. Thanks for the update. We have a great maintenance team to take care of maintenance issues. Always call the front desk for help. The location is perfect for everything you want to do in Orlando. Beach! Parks! Conventions! Golf! You visited during our Spring Break Season! Crazy Time!!! Perfect place for our family of four. Each of my toddlers had their own room which made for easier bedtime and sleeping! Loved having a kitchen! Kids loved the pool. Great location and quick drive to Disney and east getting to/from airport. Next to outlet mall, grocery and Walmart at next stoplight, gas station across the road. Would definitely stay again! Indulgent Spa, Pirate Ship Plunge Pool with water slide, Spectacular zero-entry pool with water falls, jacuzzi Style hot tubs and hammocks by the Pool side Bar, Frankie Farrells Irish Pub, on site Pizza Hut, Free scheduled transportation to Walt Disney World Resorts, Sea World, Universal Studio's, Travel Agent on site, Premier Outlet Mall next door. Game Room for all ages, Convenience Store and Gift Shop on site. Your Complete balanced is due upon placing your reservation. A final email with a current confirmation number will be sent to you by the property owner.